Mother Brown's Dining Room sits on a quiet corner in San Francisco’s Bayview neighborhood, on the southeastern edge of the city. In one direction, industrial warehouses and auto repair shops dominate the view. In the other is a residential neighborhood. 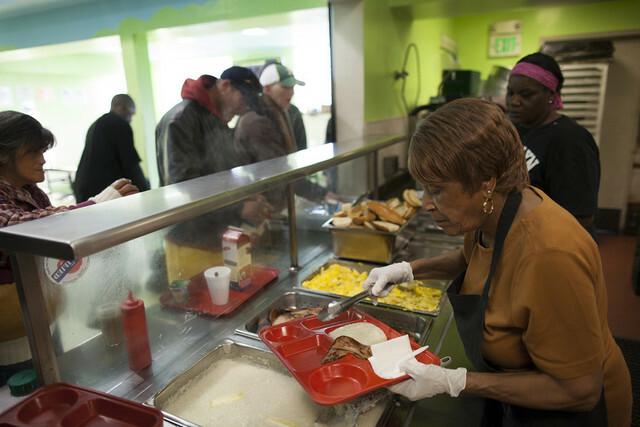 The soup kitchen began as a mobile feeding center 20 years ago, but now has a permanent site at 2111 Jennings Street, where more than 7,000 people get hot breakfasts and dinners each month. Now, San Francisco is proposing building a 100-bed homeless shelter in a warehouse next to Mother Brown’s. The Planning Commission is considering the proposal because it requires a special use permit to convert the industrial warehouse into a shelter. They will vote in the coming weeks. If approved, homeless people in the area would have a bed for 90 days before rotating out. Ultimately the goal is to get homeless people into supportive housing, but sometimes it can take people a little while to adjust to living indoors after a long time on the street. A bed is a good first step. People staying at the proposed shelter would also have access to meals and services like cheap laundry and employment counseling next door at Mother Brown’s. “We want to bring the services to where the individuals are, rather than forcing long-term Bayview residents who may be homeless to come to the central city for services,” said Trent Rhorer, executive director of the city’s Human Services Agency. His staff first applied for grant money to build the shelter in 2011 and has been working ever since to win over community support. It’s been a tough sell. A vocal group of residents say that putting a homeless shelter in the Bayview follows a pattern of the city pushing problems from the center of the city out to its farther-flung neighborhoods. They say if Bayview was a wealthier neighborhood the city wouldn't be trying to get away with something like this. Mayer’s group is trying hard to change the image of Bayview, which has long been associated with crime and poverty. They hold workdays to clean up public parks and are trying to lure new businesses to the area. District 10's Supervisor, Malia Cohen, has thrown her support behind the opposition. She says the city didn't get enough community input before siting the shelter. That's a complaint of many residents as well. They say they knew nothing about the proposed shelter until it was up for a vote before the Board of Supervisors. Trent Rhorer admits that the city applied for the initial grant to support the shelter quickly because of a late deadline, but says the city has held several community meetings and public hearings since then. He also says he has personally communicated with many of those expressing concerns. "Unfortunately, the byproduct of all this is that we're seeing really fierce, what I would call, nimbyism [Not In My Back Yard]," Rhorer said. "Folks simply don't want a homeless shelter near where their places of business are. Well, the reality is there are homeless individuals in the Bayview and they are currently being served, I would argue, inadequately with a resource center and a temporary shelter." Other members of the Bayview community view BRITE’s position on the homeless shelter as aggressive. 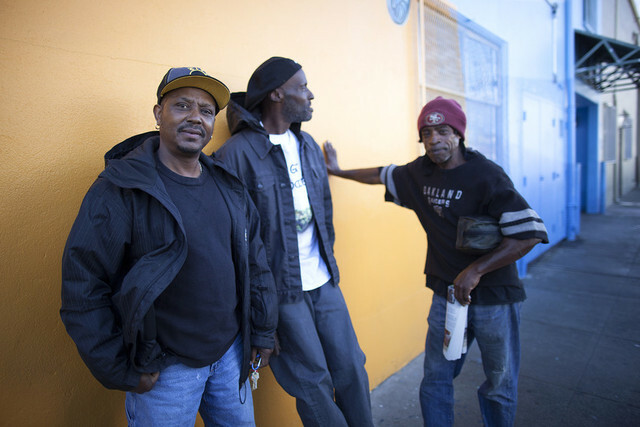 Many, but not all, of the homeless people that Westbrook serves each day grew up in the Bayview. The recent economic downturn hit this part of the city hard, and many people lost their homes. Westbrook and other members of the African-American community in the neighborhood see the homeless shelter as one of the last ways to fight gentrification. As a Bayview business owner, Robinson wants to see a more vibrant neighborhood, just as much as BRITE. He remembers when 3rd Street was a bustling commercial corridor with theaters, shops and restaurants. He’d like to see it bustle that way again, but he wants other long-term residents of Bayview who he grew up with to be part of that revitalization. He fears that without serious efforts by the city to provide housing to extremely low-income people, the historic African-American community in Bayview will be completely pushed out. San Francisco’s black population was at its peak in the 1970s, but has been slowly dwindling since the Hunter's Point shipyard closed. In 1990, African-Americans made up 10.5 percent of San Francisco’s population. Twenty years later the census puts that number below 6 percent today. The African-American population in the Bayview over the same time frame was cut in half and is now around 32.2 percent. Asians now hold a slight majority in the district with 32.6 percent of the population. Some of the homeless who visit Mother Brown’s for services sleep sitting upright in chairs in a room above the dining room. They complain of poor sleep and swollen ankles from being unable to recline. Bayview does have another homeless shelter run by Providence Baptist Church, but people can only come in after 10 p.m. and have to leave at 7 a.m. They sleep on mats on the ground and have to take their belongings with them during the day. At last count, there were nearly 2,000 homeless people in District 10, where Bayview is the largest neighborhood. They sleep on the street and in cars, in lieu of a permanent home. That’s the second-largest number concentration of homeless in the city, after the Tenderloin. Some of the homeless aren’t respectful of neighbor’s property when they pass by on their way to Mother Brown’s. Those irritations are starting to add up and Clark wants assurances from the city that it will deal with these issues before she can trust it to manage an even larger facility for the homeless. “I'm concerned that the city is being irresponsible by not communicating with the neighbors and deciding to expand it into a full shelter without really understanding that there are some problems that need to be solved first,” Clark said. The city plans to set up a citizen’s advisory committee to facilitate communication about issues like the ones Clark raises. Rhorer is hopeful that if the homeless have a shelter to go to during the day, with bathrooms and storage, some of these problems will subside. Larry Williams agrees that a shelter could help some people turn their lives around. “If you had a bed, a place to lay down at night, where you could think at night, a place to map your day out for tomorrow so you can get started. That's what we need around here,” he said.